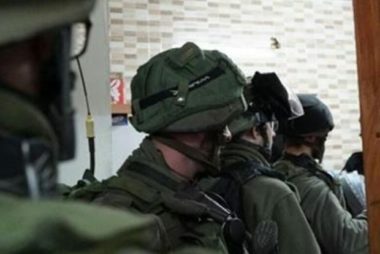 The Palestinian Prisoners’ Society (PPS) has reported that Israeli soldiers abducted, on Monday at dawn, twenty-two Palestinians in several parts of the occupied West Bank, after the army invaded and ransacked dozens of homes. It also said the soldiers caused dozens of Palestinians to suffer the effects of teargas inhalation in Balata refugee camp, near Nablus, in northern West Bank, and Deheishe refugee camp, south of Bethlehem. Also in Nablus, the soldiers abducted Ezzeddin Marshoud, Mahmoud Faisal Qawareeq, Anas Eshteyya and Nasr Shreim. The soldiers also shot, earlier Monday three Palestinians with rubber-coated steel bullets, and caused dozens to suffer the effects of teargas inhalation, in Orif village, south of Nablus, after the residents intercepted illegal colonialist settlers invading their village, before attacking homes. In Qalqilia, in northern West Bank, the soldiers abducted Mahmoud Nabil Qashmar, 23, and Sa’id Bilal Sweilem, 26. Furthermore, the soldiers abducted two Palestinians, identified as Majd Hani Barakat and Jihad Fawzi Taleb, from Jenin refugee camp, in the northern West Bank city of Jenin. 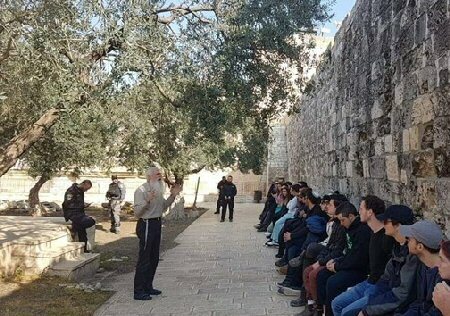 In Ramallah, in central West Bank, the soldiers invaded many communities, broke into and searched homes, and abducted the head of Birzeit University Students’ Council, Yahia Rabea’, and Bassel Ladadweh, both from the al-Mazra’a al-Gharbiya town, in addition to Omar Mahmoud Rabea’ and Omar Jamal Sheikh, from Deir Abu Mashal town. In Qalandia refugee camp, north of occupied Jerusalem, the soldiers searched homes and abducted Bassem Zayed and Ammar Yasser Mteir, while Amjad Abu Sneina and Mohammad Abu Sneina, were taken prisoner from their homes in Jerusalem’s Old City. The army also abducted Yousef Mahmoud ‘Aassi, Abdullah Mahmoud ‘Aassi and Laith Abdullah Mer’ey, from their homes in Qarawat Bani Hassan, northwest of Salfit. In Hebron governorate, in southern West Bank, the soldiers abducted Islam Adnan Mujahid, Noureddin Salama Qawasmi and Yousef Abdul-Aziz Qawasmi.